I was always fascinated by the Asian martyrs, specifically in China and Japan since those were the ones I usually could find info about. After becoming more interested in Takashi Nagai (here and here), I have even more of an attachment to St. Paul Miki and his companions since they formed the foundation of the Christian community that Nagai was part of. 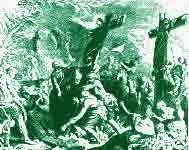 As they awaited death the entire group sang the canticle of Zachary (see Luke 1:67–79). The executioners stood by respectfully until they had intoned the last verse. Then at a given signal they thrust their spears into the victims’ sides. On that day, February 5, 1597, the church of Japan welcomed its first martyrs. This is the Church's prayer for today. I love the collects and the way they give us pointers, if we reflect on them, on how to live a devout life. It's like a tiny catechism in a prayer. I picked this up from Catholic Culture which is another excellent resource. 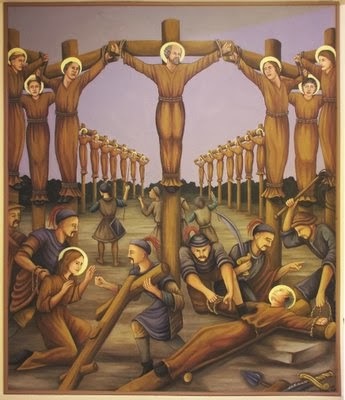 Collect: O God, strength of all the Saints, who through the Cross were pleased to call the Martyrs Saint Paul Miki and companions to life, grant, we pray, that by their intercession we may hold with courage even until death to the faith that we profess. Through our Lord Jesus Christ, your Son, who lives and reigns with you in the unity of the Holy Spirit, one God, for ever and ever.